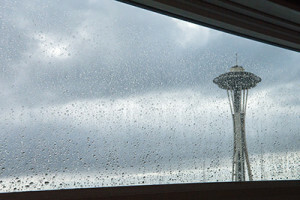 Home Stress Sleepless and Stressed in Kirkland? Are you sleepless and stressed? Are anxious thoughts keeping you up at night and tense during the day? According to a study by the American Psychological Association those of us living in the Kirkland – Seattle area are slightly better at managing our stress levels than other Americans, but we still have difficulty achieving stress management goals. In a survey involving over 3000 people, those in the millennial generation or people born between the early 1980s to early 2000s were most affected by stress, followed closely by Generation X, born between early 1960s to early 1980s. These younger generations reported an average stress level of 5.5 and 5.4, compared to 4.5 for Baby Boomers and 3.5 for older people. 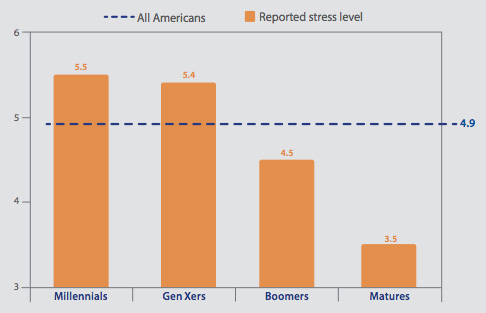 Reported levels of stress by age. Graph by American Psychological Association. Considering how much time and energy many of us spend pursuing our careers, it’s not surprising that work is a major source of stress. Living in Kirkland, Bellevue, Seattle, or Redmond means that you’re probably working long hours, beyond the usual Monday to Friday, 9-to-5. At a large company, production cycles and political maneuverings can be tough challenges. If you’re working for a small business, you may be taking on many different responsibilities and pressured to do more with less. Miscommunication between co-workers is common, sometimes leading to misunderstanding and frustration. The result is that even when we’re not at work, many of us are thinking about work. This can lead to feeling stressed.